1. Sharvit HaZahav. Judeo-Arabic. By Rabbi David Danino. Printed by Razon, Casablanca. 1938. 2. Korban Minchah, Judeo-Arabic. By Rabbi Baruch Asbagh. Razon printing, Casablanca 1939. 3. Shevach Hayyim, wonderful stories about Rabbi Haim Pinto, by Rabbi Machluf Tarim. Page before the cover has a picture of Rabbi Haim Pinto. Casablanca 1939. 4. 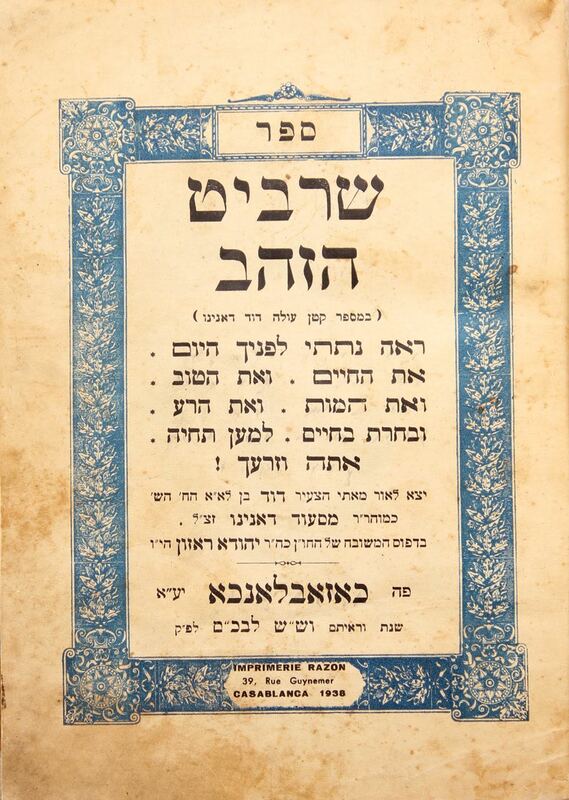 Tehila L’David, poems by Rabbi David Hassin (first edition printed in Amsterdam 1806) with additions by Rabbi Aharon ben Hassin (separate covers) with Tefila L’David, Mekoman shel Zevachim, Yikra d’Shachvi. Casablanca, 1931. 5. Sha’ar Yerakot, Judeo-Arabic. By Rabbi David Asbagh. Razon printing, Casablanca 1943. Different sizes and conditions, generally good.